The Star-Touched Queen is one of those books I took way too long to read without a good excuse. One person told me they didn't think I'd enjoy it, so I just never did pick it up. This January I had the pleasure of meeting Roshani Chokshi at ALA in Atlanta and picked up a copy of A Crown of Wishes, book two in this series, so it seemed like a good time to finally give it a go! I'm going to switch things up with this review and start with the writing. I had heard that the writing in The Star-Touched Queen was very flowery, which I tend to get bored with, and that's one reason I was told to avoid it. After reading it, I have to say I disagree. This book isn't flowery, it's mythology. I always laugh at people who talk about what they minored in as if it makes them experts, but I did happen to minor in Classics. I read a lot of myths. A lot. And this reads like them, just a little prettier and more appropriate for the 21st century. While I can see why some people might have been put off by the writing style, I happen to love mythology and I loved every single thing about The Star-Touched Queen! The main character of this story is Maya, the daughter of the Raja, and she's pretty much a badass. She has lived her entire life in the shadow of a horrible horoscope. Maya is shunned by everyone around her and seen as cursed, so she's surprised when her father decides to marry her off for political reasons. Although she is upset, Maya resolves to do this to help her father, but the husband she chooses is much more than she expects. Amar is the Raja of his own kingdom, one Maya has only heard about in stories. He is dark and mysterious and handsome... He is totally my kind of love interest. Little bits and pieces about him are revealed as the book goes on and, trust me, this guy is fascinating! I'll give it to you straight - the romance in The Star-Touched Queen is insta-love, but it totally and completely works. I loved Amar and Maya so much! Maya is simultaneously completely out of her element, while being totally sure of herself. She always makes the decisions she feels are best for her, even if they don't always work out in the end. I can't say too much about Amar's character without spoilers, but Amar by himself makes this book worth reading! Just like the writing and characters, the world building is incredible. The descriptions of both the real world and the Otherworld locations like the Night Bazaar and Akaran were gorgeous. I could easily visualize the locations and the magic of the different places Maya visited. Even the different rooms in Amar's palace were each distinct and easy to picture! Roshani should really get an award for the magic she weaved into this book. 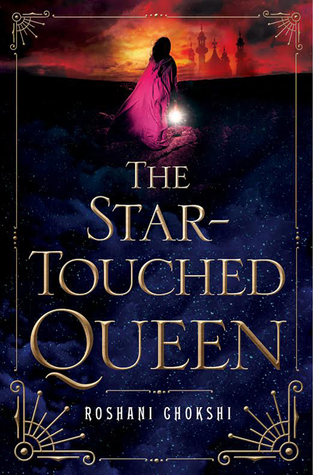 I cannot say a whole lot about the plot of The Star-Touched Queen without spoiling it, but I will say that the story completely surprised me a couple times! I expected a pretty straight-forward story that went in one direction, but I ended up getting blindsided halfway through... and it was awesome! I had a lot of feels and nearly threw the book across the room at one point, but it's too pretty and I didn't want to damage it, so I persisted. The ending wrapped up nicely so that this could easily be read as a standalone, although I'm definitely excited to see what happens in A Crown of Wishes! In case I haven't made it clear, The Star-Touched Queen totally exceeded all of my expectations. I went in not knowing if I'd even want to finish it, and came away clearing a space on my favorites shelf! If you're a fan of fantasy, mythology, or retellings (did I mention this is a Hades and Persephone retelling?) and you've been avoiding this book for any reason, I highly recommend you take the plunge sooner rather than later!